It's not often that I'm ready to post the same night that I cooked a dish, but this one came together so quickly and easily that it's worth jumping on! Stir fried meals are one of my favorite ways to get dinner on the table, especially when I have leftover veggies to use up. Because of that, I always have noodles, rice, Asian condiments and sauces in my pantry for that random occasion. For tonight's dinner, I had a ton of leftover cabbage, some frozen shrimp I'd picked up on sale, and the usual onions, garlic and ginger. I didn't have any other veggies on hand like carrots or peppers, so I thought it would be a good time to try out a package of organic ramen noodles that I was ecstatic to find at my favorite grocery store, Wegmans. I haven't had the fake stuff in several years, mostly because those MSG-laden seasoning packets give me terrible headaches.Well let me just tell you, "Japanese wheat noodles" are a whole lot tastier than whatever is in those crunchy instant noodles we've all succumbed to in hard times. So although I might be a little late jumping on the authentic ramen noodles craze that's taken over major cities, this dish was worth my wait. The sauce was light but flavorful. Peanut noodles tend to feel a little heavy to me, so I added just enough peanut butter to bring in the flavor without overwhelming the other seasonings. And who doesn't love Sriracha? 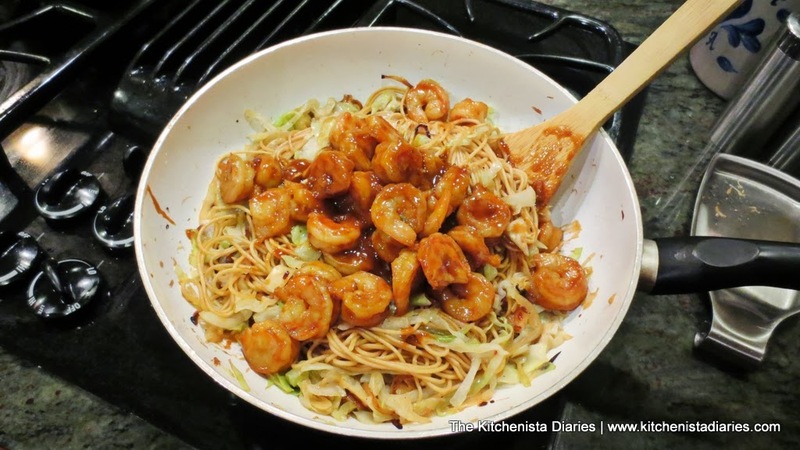 Feel free to make this one as mild or as spicy as you'd like...the beauty of doing stir fry dishes at home is that they are completely up to your tastes and imagination! One of the most important things to do for stir fry dishes is to get your prep work done so that everything is ready to cook - otherwise known as "mise en place." I started by slicing my onions, cabbage and garlic, and mincing ginger. I'm one of those weirdos who actually finds prep work to be relaxing! 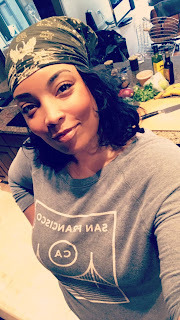 It's my quiet time to think and finalize the details of the dish I'm cooking. 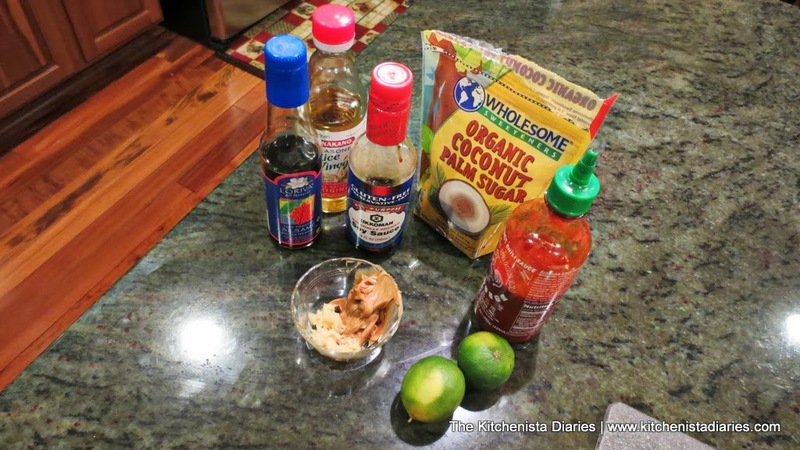 My stir fry sauces almost all start out with variations of the group of ingredients below. I thought a little bit of creamy peanut butter would bring out the best in this dish. To make the stir fry sauce, combine the peanut butter, Sriracha, rice wine vinegar, sugar, sesame oil, 2 tsp of minced ginger and 2 tbsp of the soy sauce. 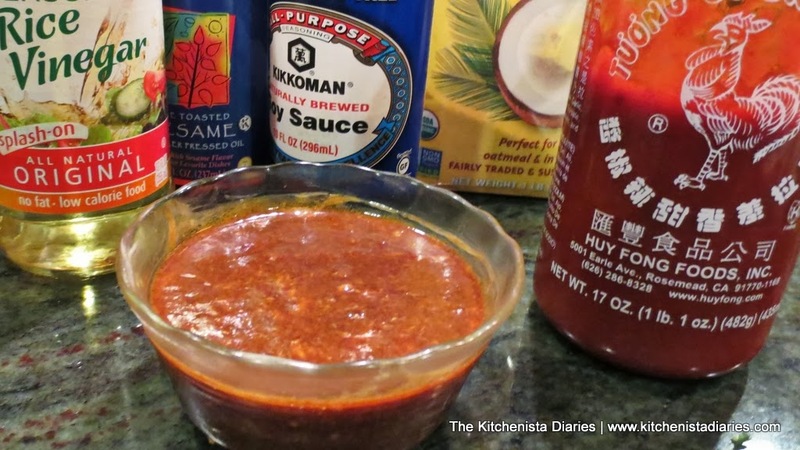 A good stir fry sauce has a balance of sweet, sour, salty & spicy elements. 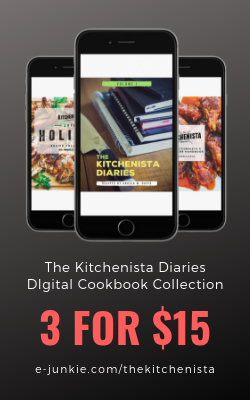 Because there are so many variations in flavors depending on the brand of condiments used, you'll need to taste and make adjustments to your liking. I used thawed "EZ-peel" frozen shrimp that were already deveined. After peeling and rinsing, use a couple paper towels to soak up any excess water. Have I told y'all how much I miss the relatively inexpensive and insanely fresh seafood of South Florida? Fresh shrimp is officially a once in a blue moon treat for me now...I jumped on a good sale and picked up a huge bag of frozen shrimp to satisfy my cravings. 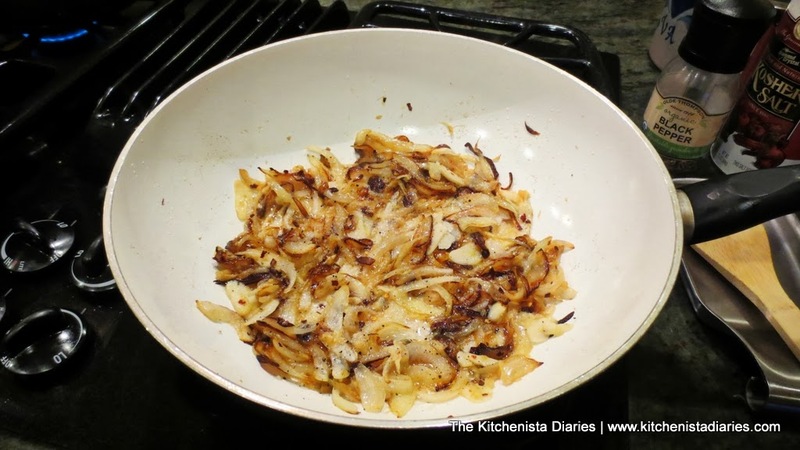 In your wok or deep skillet over medium high heat, add 2 tbsp peanut oil and the sliced onions. 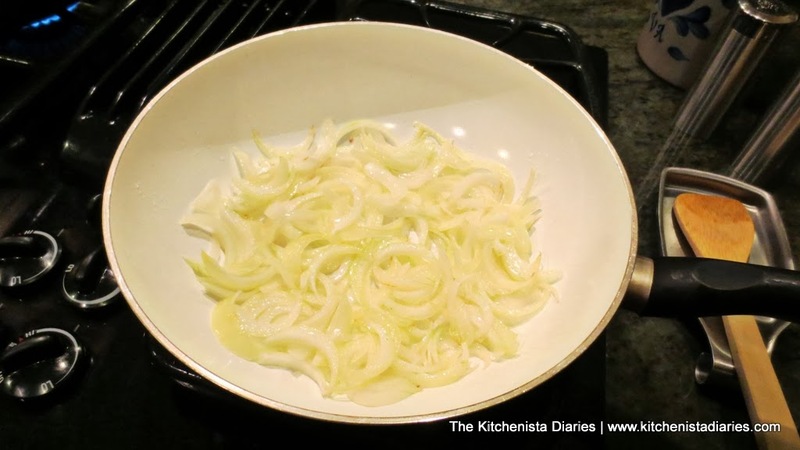 Cook for a few minutes until onions start to soften and then brown around the edges. While the onions are cooking, you can get your chicken stock heated. This is what the ramen noodles will cook in later. I added the remaining 2 tbsp of soy sauce to the stock to get max flavor in those noodles. 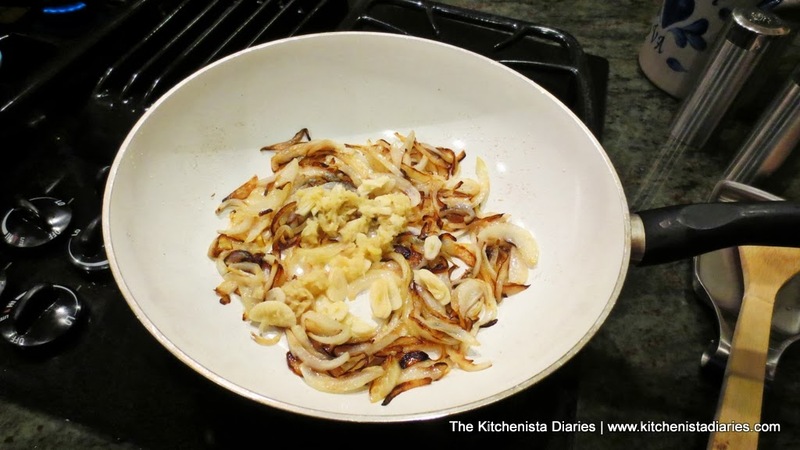 When the onions have browned a little, add the sliced ginger and minced garlic. Stir for a minute until it becomes aromatic. Slices of garlic are less likely to burn in stir fry dishes than tiny chopped pieces, plus they become delicious little bites of caramelized garlic in the finished dish. 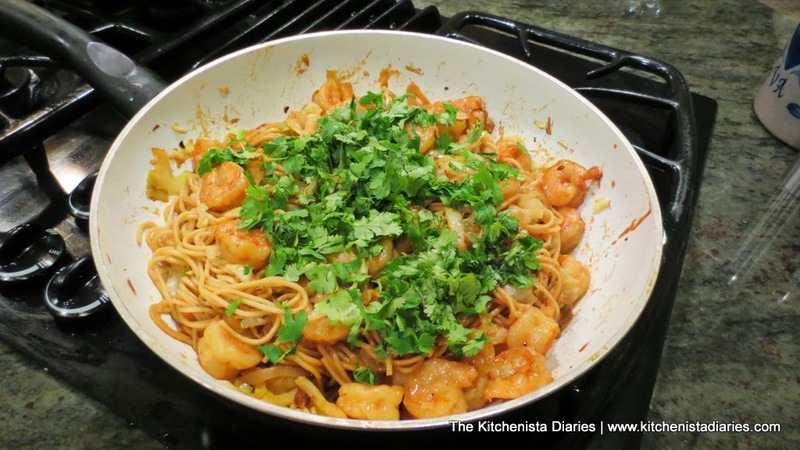 Add a good pinch of red pepper flakes and another tbsp of peanut oil to the skillet. 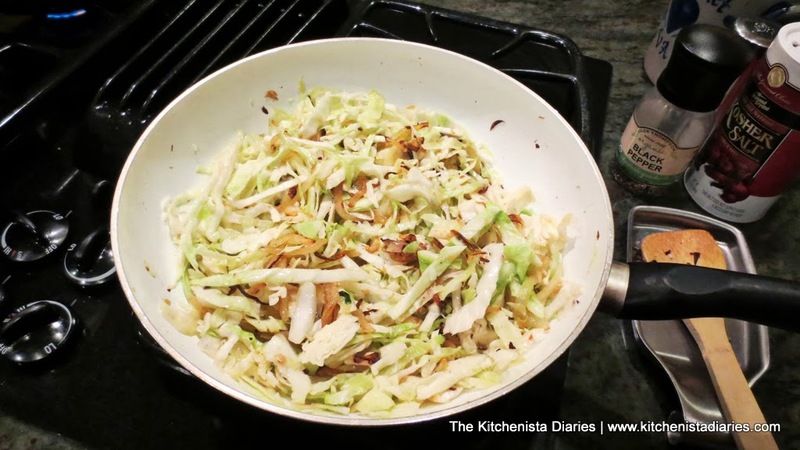 Toss in the shredded cabbage, a couple pinches of kosher salt and cracked black pepper, and cook for a few minutes until it starts to wilt. I love buying whole heads of cabbage; it really is one of those inexpensive veggies that just stretches from meal to meal for literally pennies. Once the chicken stock and soy sauce has come to a boil, add the ramen noodles. Cook for 4 minutes, stirring occasionally. 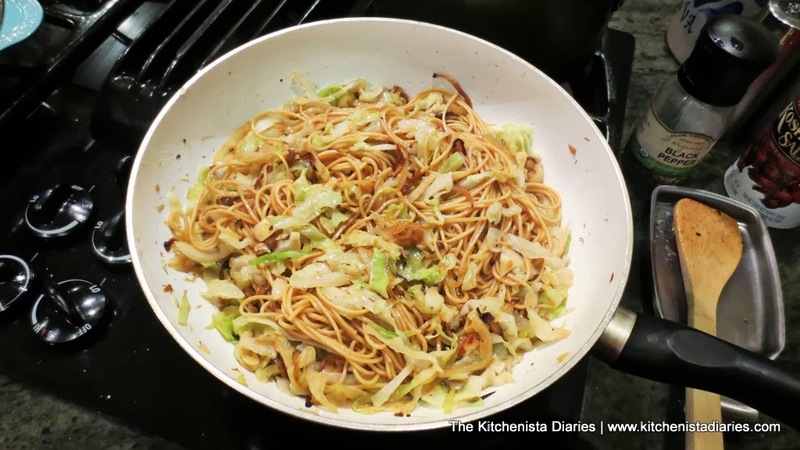 Use a slotted spoon to drain and transfer the cooked noodles directly into your stir fry skillet. Don't dump out that broth. You may need a little to loosen up your sauce later; if not, it's perfectly good to reuse for soup. 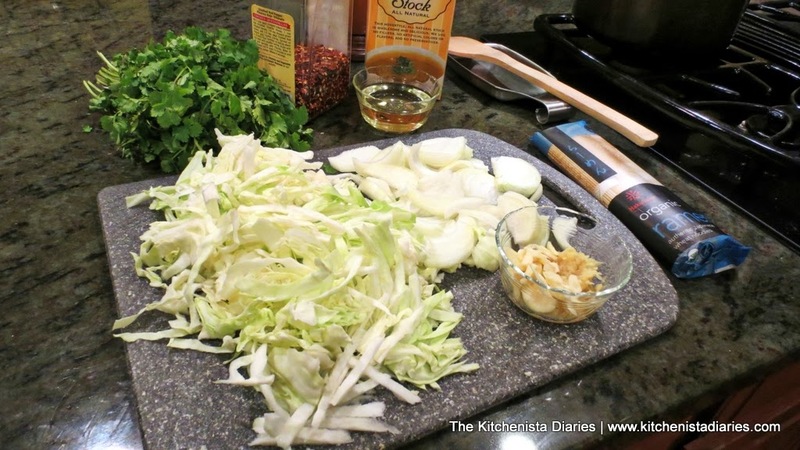 Stir the ramen noodles into the cabbage and onions, reduce heat to low. 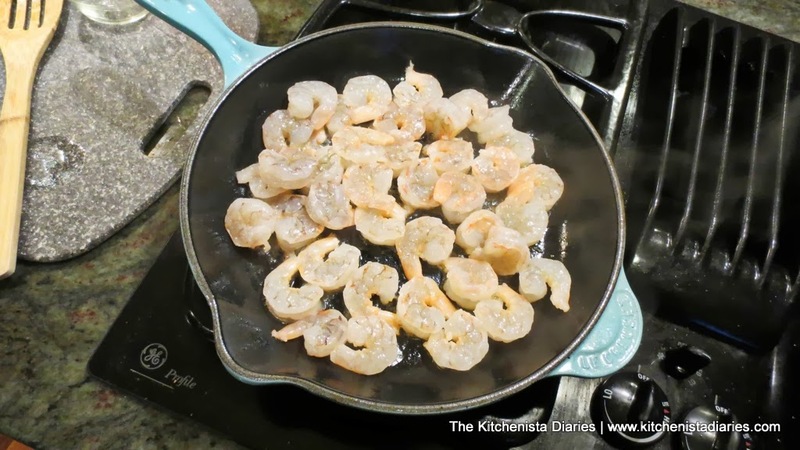 Meanwhile, in your other skillet, you'll be cooking the shrimp. 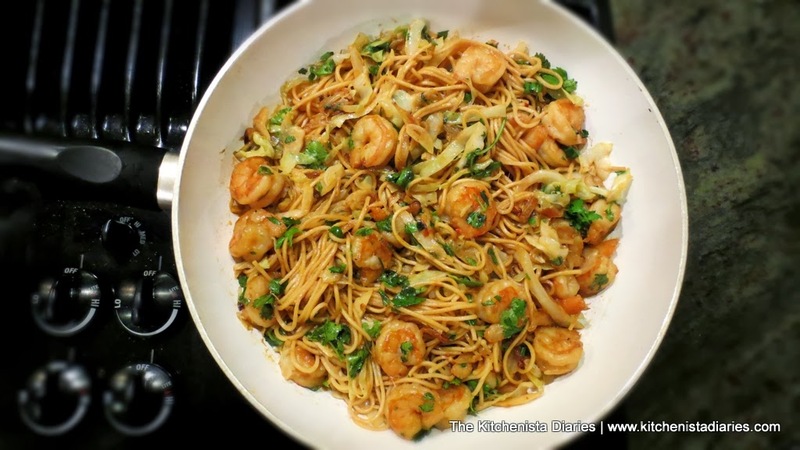 Time that so that the shrimp gets going around the same time as the noodles cooking. Heat the remaining tbsp of peanut oil over medium high heat and add the shrimp. 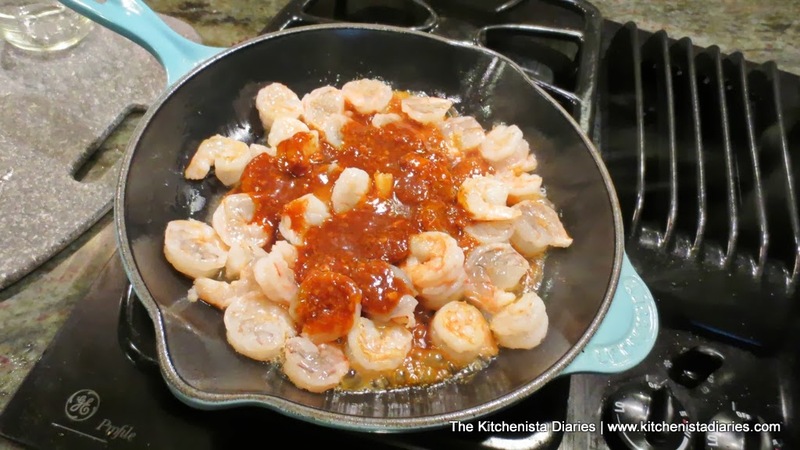 Just as the shrimp start to turn pink and opaque around the edges, pour in the prepared stir fry sauce. These were smaller shrimp so that only took a minute. 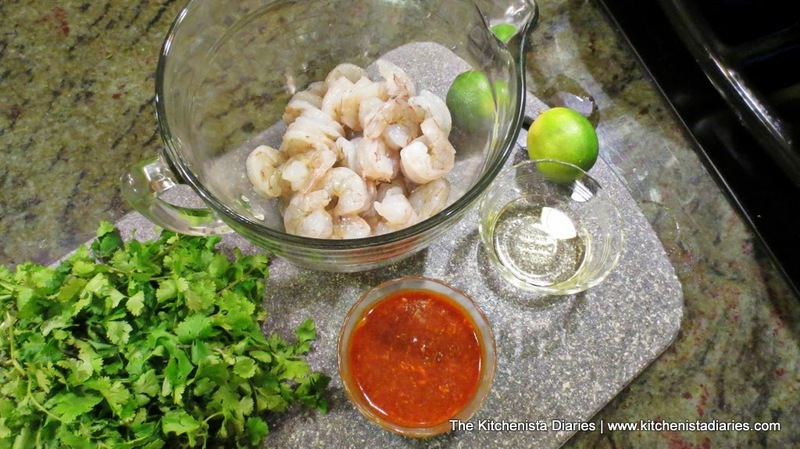 Gently toss the shrimp in the sauce to fully coat it, and stir in the zest of one lime. 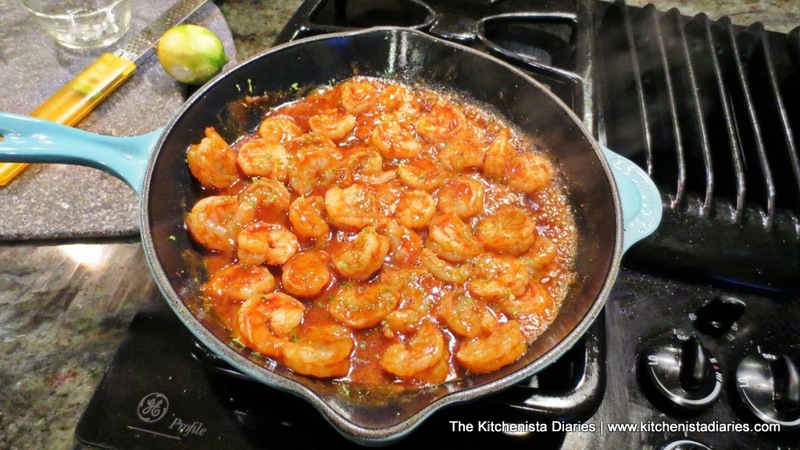 The shrimp will only need another minute or two to cook, then you can turn off the heat. 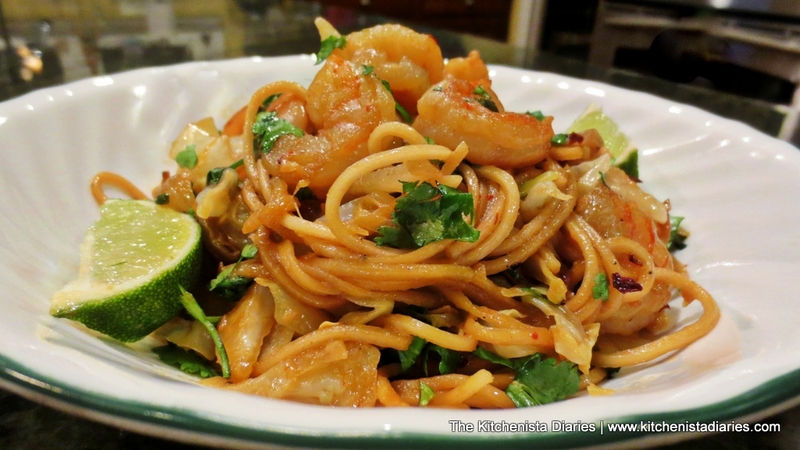 Transfer the cooked shrimp into your stir fry dish, along with any extra peanut sauce. 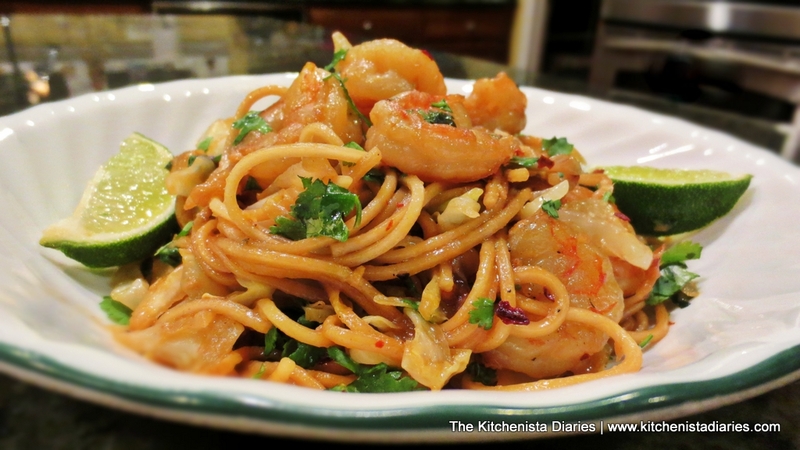 Toss to incorporate the shrimp and sauce with the noodles and cabbage. 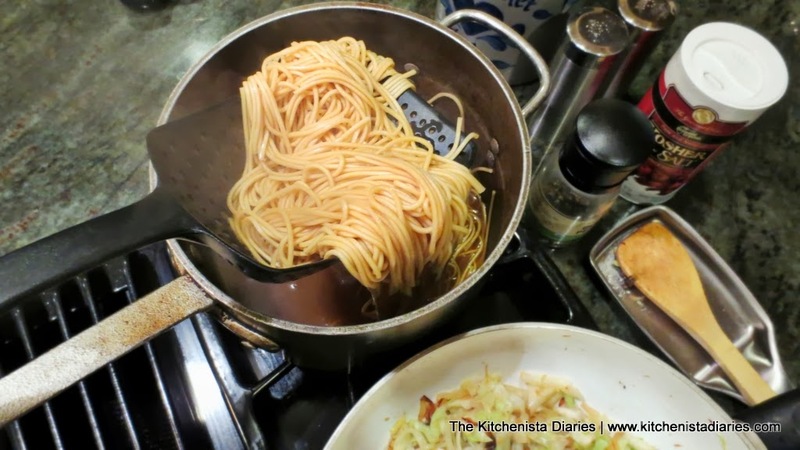 If your dish needs a little more liquid, add some of the chicken stock to the skillet. Taste test for seasonings, then finish with the juice of the lime you just zested, along with a handful of chopped cilantro. Turn off the heat and get ready to dig in! It smells fantastic... Jaden was sitting at the counter salivating by this point! Serve hot with a couple extra lime wedges for garnish. Enjoy!